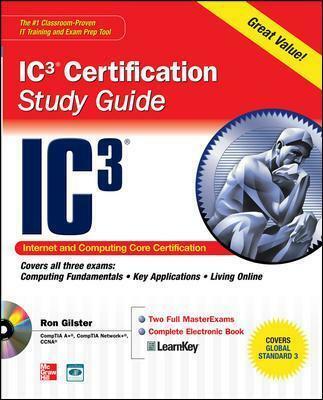 The best fully integrated study system availableCOVERS GLOBAL STANDARD 3With hundreds of practice questions and hands-on exercises, IC3 Certification Study Guide covers what you need to know--and shows you how to prepare--for the Internet and Computing Core Certification exams. Ron Gilster, CompTIA A+ Network+. CCNA, is the author of many bestselling books on networking, PC hardware, and IT career certifications, including CEA-CompTIA DHTI+ Digital Home Technology Integrator All-in-One Exam Guide, Second Edition. Ron Gilster is the author of several best-selling books on networking, PC hardware, and IT career certifications. Ron holds a variety of IT certifications and has worked in networking and computing for over 25 years. Ron has served in a variety of small business and corporate technical, management, and executive positions and is currently a university instructor at several universities and colleges in the Spokane, Washington area.